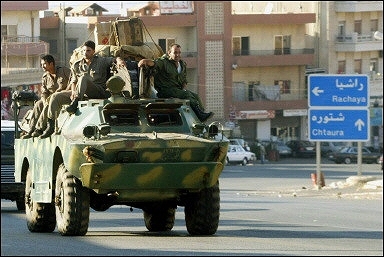 Syrian soldiers stand guard near army tank ZSU-23-4 in Dahr Baydar to Lebanon. 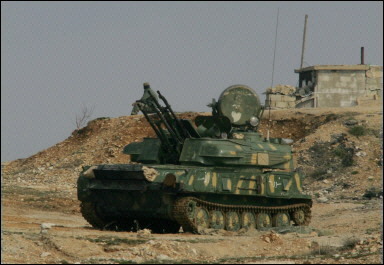 Syrian soldiers guard an army tank in Dahr Al-Baydar, on the main Beirut-Damascus highway linking the capital with the Bekaa valley. A UN team vowed to be impartial in probing here the murder of ex-premier Rafiq Hariri, as Lebanon waited for powerful neighbour Syria to begin a promised troop redeployment. Slovak police officers stand to the street of Bratislava to secure the visit of U.S. President George W. Bush. Pakistani UN UR-416 wheled armoured vehicle are used to Haiti for peacekeepers. Pakistani UN peacekeepers in an armored personnel carrier is posted outside the National Penitentiary in Port-au-Prince, Haiti, on February 20, 2005, one day after a group of armed men led a daring assault that freed 481 of some 1,250 prisoners. Among those who escaped were two former government officials, but they turned themselves in late Saturday night. Philippine military wheeled armoured vehicle against Muslim rebels. A Philippine military tank patrols in the outskirts of Jolo town, southern Philippines February 9, 2005. Philippine military planes bombed Muslim rebel positions on a remote southern island on Wednesday and troops attacked guerrilla bunkers in pitched fighting that has killed 60 people in three days, officials said. Armoured vehicles EE-11 Urutu from Venezuelan army evacuate people due to the flooding in the capital Caracas. An armored EE-11 Urutu car crosses a flooded street in Puerto Cabello, Venezuela, Tuesday, Feb. 8, 2005. At least 5,000 people evacuated their homes due to the flooding in the capital of Caracas and six northern states, said Col. Antonio Rivero, the country's civil protection director. Militiamen fired in the direction of the Somali parliament speaker Shariif Hassan Sheikh Aden. A woman holds a Somali flag in front of an armoured vehicle BMP-2 Tuesday, Feb. 8, 2005 in Mogadishu. Militiamen fired in the direction of the Somali parliament speaker, Shariif Hassan Sheikh Aden, as he and his delegation toured the capital's port Tuesday, highlighting the challenge his government-in-exile faces as it considers returning home. No one was hurt. Berne Police force intervention to the Spanish consulate wher hostages were taken by unknown intruder. An armored vehicle Piranha Mowag of the Berne police force pulls up in the neighborhood of the Spanish consulate where hostages were taken by an unknown intruder, February 7, 2005. Police cordoned off the area around the consulate, located in an upscale neighborhood near the historic center of Berne, and stationed sharpshooters around the building of the consulate. Nepali military personnel keep watch on a street in Kathmandu against Maoist rebels. Nepali military personnel sit atop an armored vehicle as they keep watch on a street in Kathmandu, February 4, 2005. Nepal's army said on Friday it would step up its offensive against Maoist rebels fighting to overthrow the monarchy, days after the king sacked the government, arrested political leaders and seized power. Turkish riot police officer with armoured vehicle guards the US Embassy during the visit of U.S. Secretary of State Condoleezza Rice to the Turkish capital. Turkish riot police officer stands in front of a police armored personnel carrier as he guards the main entrance of the U.S. Embassy in Ankara February 5, 2005, during a demonstration against the visit of U.S. Secretary of State Condoleezza Rice to the Turkish capital. Rice is expected to arrive in Turkey Saturday evening as part of her eight-nation tour of Europe and the Middle East. German army armoured vehicles from ISAF searching for the missing Afghan plane in Khaki Jabar. A convoy of German armoured vehicles from ISAF searching for the missing Afghan plane in Khaki Jabar, a district southeast of Kabul, where officials said the plane was last reported on Thursday afternoon, but returned to base empty-handed on Friday, Feb. 4, 2005. NATO and Afghan forces suspended their ground and air search as darkness closed in Friday for an Afghan passenger jet carrying 104 people after it disappeared from radar screens during a snowstorm near the mountain-ringed capital. US Army new finished Humvee. U.S. Army Chief of Staff Peter Schoomaker stands next to a finished Humvee as he speaks to employees of Armour Holding's after a tour of the plant, Friday, Feb. 4, 2005, in Fairfield, Ohio. US Army patrol in the street of the city of Mosul with weeled armoured vehicles Stryker. Downtown Mosul : An Iraqi boy walks beside a patrolling US military armored vehicle in the restive northern Iraqi city of Mosul.